Following the organizing of mix fight team Tornado-InstaForex and signing a contract with a basketball player Ilona Korstin, the InstaForex sports family was enlarged with the rally team of such a high level and serious ambitions. 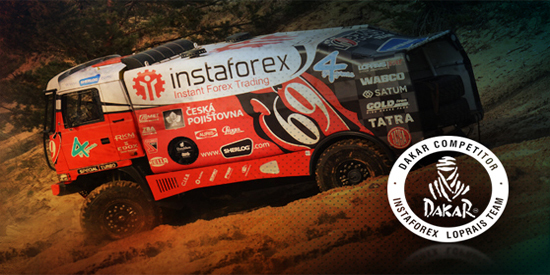 The ancestor of InstaForex Loprais Team is a regular participant of the Dakar rally Tatra team. It created conditions for the new team to fight for the top positions even at the beginning of its career. Experience of InstaForex Loprais Team pilot multiplied by traditions to achieve the purpose preserved by InstaForex has already led the team to the glorious victories in the world�s largest competitions, including the Dakar series. 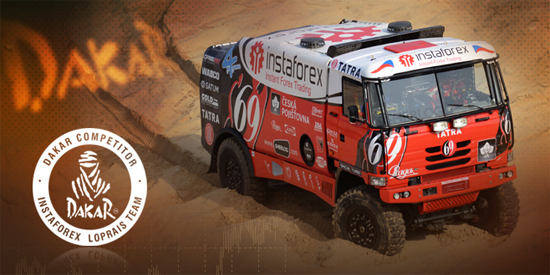 Just imagine that in the year of its creation InstaForex Loprais Team celebrated the victory over such strong rivals as Kamaz Master, IVECO and MAN in the second largest rally The Silk Way 2011. During the Dakar 2012 InstaForex Loprais Team was vigorously fighting for the victory but after an accident lost its position of pretender to the top place in the ranking. The Dakar 2013 was better than the previous competition but technical problems cause significant loss of time, so our team was only the sixth. Nevertheless, according to the experts and journalists, InstaForex Loprais Team can be announced as an unofficial winner of the competition for its desperate struggle and the time loss it managed to reduce. InstaForex offers to learn more about the modern and high-tech type of sport, the Dakar rally, and to support the new winning team InstaForex Loprais. We are to be the best!